Original tape date: February 10, 2014. First aired: February 14, 2014. The assistant curator Naima Keith takes us on a tour of the groundbreaking exhibit “The Shadows Took Place” at The Studio Museum in Harlem about Afro-futurism and contemporary art. Afro-futurism explores race through the lens of science fiction, fantasy and magic realism. In the story, we look at works from artists around the world grappling with Afro-futurism through photography, painting, drawing, sculpture and video. We also look at the influences on Afro-futurism from science fiction writers such as Octavia Butler and Samuel Delany, sonic innovator Sun Ra, futuristic movies like Star Wars, District 9 & The Wiz and the music videos of Parliament Funkadelic and Labelle. Magalie Laguerre-Wilkinson takes you on a culinary tour of New York City restaurants in museums, where you don’t typically expect top-notch food. Carol Anne Riddell brings you a story about love and compassion that you might not expect -- no chocolates or roses here. Meet Helen Dillon, an 84 year old documentary film maker, who spends her free time volunteering with prisoners, bringing warmth to their hearts and her own. Donna Hanover gives us an inside look at world-renowned chocolatier Jacques Torres and how he crafts his delicious masterpieces. Co-Chef, Michael Tyler, prepares a mackerel dish at Saul Restaurant in the Brooklyn Museum. 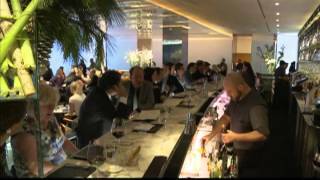 MoMA General Manager, Dino Lavorini, talks about the design of the in museum restaurant.